On Tuesday, March 25, and Thursday, March 27, 2014 the Junior League of Portland, Maine hosted a total of 90 children from the greater Portland area at the sixth annual Kids in the Kitchen events. A group of volunteers trained by the Junior League educated children about the food lifecycle -- from dirt to dish -- as they planted seeds, discovered composting, learned about inexpensive, healthy food choices and prepared simple, tasty snacks. Crusher, the Maine Red Claws mascot appeared at the March 25 event, adding to the excitement of the 62 youngsters who participated in the festivities at the Boys and Girls Club of Riverton Park. The 2014 “Dirt to Dish” event theme allowed participants to experience the full food lifecycle as they planted their own lima bean seeds and dug into composting with a worm compost display. Kids learned how to use healthy and inexpensive food items to make delicious snacks from simple recipes. They also got moving with potato sack races and a dance station, and an abundance of healthy food choices for all. “There’s a common myth that eating cheap and convenient means your food has to come from a drive-thru,” said Sandra Couch-Kelly, President of the Junior League of Portland, Maine. “There are many low-cost, nutrient-rich alternatives available. This year’s Kids In The Kitchen theme of "Dirt to Dish" applied a grassroots approach to what fast food marketers have been doing for years -- getting kids excited about consuming and interacting with their food. We wanted to show kids and their families that incorporating healthy, fresh food into an active lifestyle can be simple, affordable, fun and rewarding." On March 26th and 28th2013, 100 children from the greater Portland area dug into the USDA’s “MyPlate” with the help of the Junior League of Portland, Maine. The new food plate called "MyPlate" is a simple visual cue designed to teach Americans about portion control and how to build a healthier diet. This year, the League called on the help of its superhero friends, the Fantastic Five, to offer a playful and interactive experience while teaching impressionable minds how to adopt healthy eating habits at mealtime. Each of the five superheroes, custom designed by a member of the Junior League, represented a portion of the “MyPlate.” All participants of Kids In The Kitchen took home their own copies of "MyPlate," which fit snugly in a Fantastic Five activity book full of recipes they created and sampled during the event. To encourage healthy and active lifestyles, the Junior League offered a demonstration of Nia, a sensory-based movement practice that draws from martial arts, dance arts and healing arts. "Sadly, Maine ranks 13th in the nation and 1st in New England in terms of food insecurity. 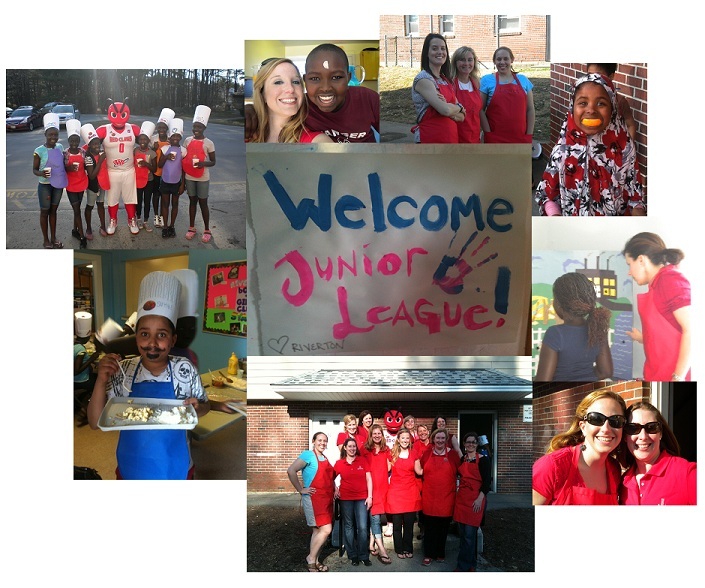 The Junior League of Portland[, Maine] has been working since 2010 to address this issue. Kids In The Kitchen serves as the perfect platform to offer children in under-served communities the knowledge and tools to combat hunger and food insecurity within their own families and neighborhoods," states Kristina Jenkins, President of the Junior League of Portland, Maine. The Junior League of Portland, Maine would like to thank Junior League International's Vice President Mary Jo Hunt for her help during the events. The Junior League of Portland Maine held their annual Kid in the Kitchen event March 20th and 21st, 2012 to create awareness of the urgent issues surrounding childhood obesity and poor nutrition. The events took place at Sagamore Boys & Girls Club and the Riverton Boys & Girls Club. The kids learned about where different foods come from, took pictures with Crusher, the Maine Red Claws mascot, decorated their own chef hat and apron, made and ate a healthy snack, and had a dance exercise party outside! Below are pictures from the March 20th event at Sagamore Boys & Girls Club. In 2011, the New Members created a passport event introducing the ideas of healthy eating, growing vegetables, exercise, drinking H2O and recycling. This event took place at the Riverton Boys & Girls Club in Portland. In 2010, the New Members helped kids at the Riverton Boys and Girls Club make healthy snacks and take home a healthy snack cookbook. 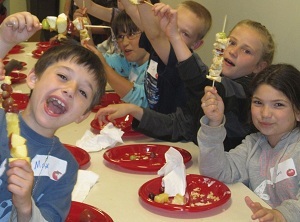 In 2009 the New Members put on a healthy eating, healthy lifestyle after-school event at the Portland Boys & Girls club where the kids made fruit kabobs and took home a vegetable plant. For more than 100 years, Boys & Girls Clubs of America have enabled young people. Today, more than 4,000 Clubs serve some 4 million young people annually through Club membership and community outreach. They provide a safe place, caring adult mentors, and high-impact youth development programs on a during non-school hours. Priority programs emphasize academic success, good character and citizenship, and healthy lifestyles.